Meet "Amy Joe". For the last few weeks each Tuesday, Amy Joe and I meet at the corner of Pine street and S. Orange ave in downtown Orlando (I work downtown and am always moving around the city). Each day for about a week I saw Amy Joe at this corner and she never asked for money...she simply said "Good morning Sir, have a great day. God Bless!!" and smiled. I wear a suit to work everyday so I get asked a lot for money quite often downtown...but never once from Amy Joe. Every Tuesday Amy Joe and I now have Lunch together. For 30 min to an hour I get to hear how positive she is even though she really has nothing. Last week Amy Joe kind of dropped a bomb on me...she struggle with reading. Amy Joe does not smoke, drink, have a drug addiction, or anything to that nature. She simply just has never had anyone teach her to read well. She began to tell me any money that she can collect she uses to rent books that help with learning to read instead of buying FOOD. This crushed me!!! She would rather learn to read to maybe find a job then eat!!! I have been blessed with two amazing parents and a family that has always had resources to provide me with anything I wanted to do. Amy Joe has not. So now not only do Amy Joe and I sit and have lunch, I'm helping her with read. I bring one book a week and we read it together Tuesday and she practices on her own throughout the rest of the week. This post is in no way to make anyone feel sorry for Amy Joe or brag about me doing something for someone less fortunate. I wanted to share this because maybe this can lead to someone helping another person. 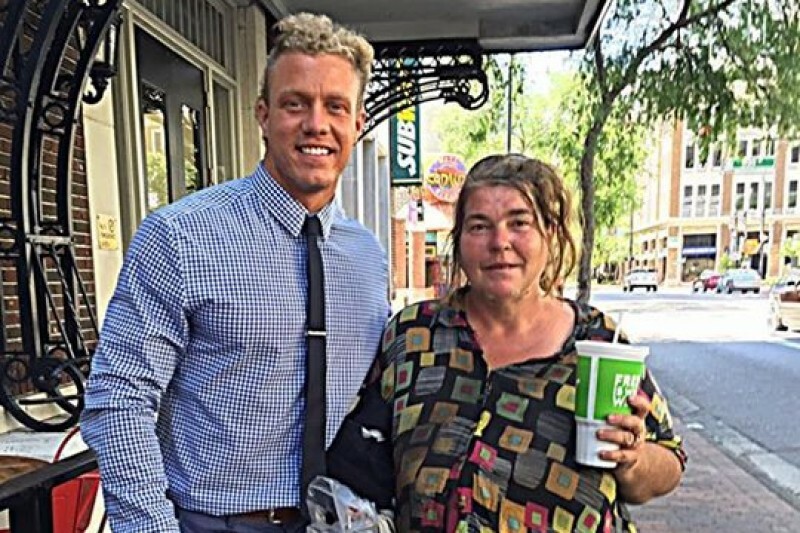 There are a lot of people out there like Amy Joe, not all are hungry, homeless, or hurt. Some could be your family or friends. Helping someone could be as easy as saying hello and smiling. I have been fortunate enough in my finances that I can take care of Amy Joe, so that's what I'm going to do. But you never know what you can do for someone until you try. Who is your Amy Joe?!?!? WE DID IT!!! I am so grateful that I have gotten to be apart of something so special. Amy Joe and I want to thank every individual that has contributed in any way helping to change her life and I also want to thank Amy Joe for changing mine. I never expected the first day Amy Joe and I had lunch what this would turn into, but I guess the greatest things in life come when you least expect them. God Bless!!! Update on Amy Joe!!!! She is doing great, we are currently working on getting her a legal ID so that she can be placed in a permanent residency (At the moment she does not have any type of identification). Thank you to every one that has supported her and has been willing to help!! Unfortunately there has been a few people that have made false allegations that I'm a fake or phony and scamming people and that is completely okay....I DIDN'T DO THIS FOR ME!!! So it doesn't matter what anyone says about me. I know there are enough good people out there that believe in what is right. Amy Joe and I both want to thank anyone that has offered to help and assure you that the funds raised are safe and going to help those who deserve it.